As our culture moves further and further from the natural world we continue to pull elements of it along with us. The more we pull these elements of the natural world along, the more bizarre their manifestation. Manicured natural experiences increasingly define our relationship to the natural world fueling eerily soothing objects and occurrences. Nature relaxation CD’s, potted plants, and captive animals provide a few examples of how we attempt to remain connected to nature while further embedding ourselves in windowless offices and paved cities. Much of this current work samples various artificial and natural elements, and then fuses them in multimedia scenarios resulting in hybridized manifestations caught in a rather "naturally synthetic" state. 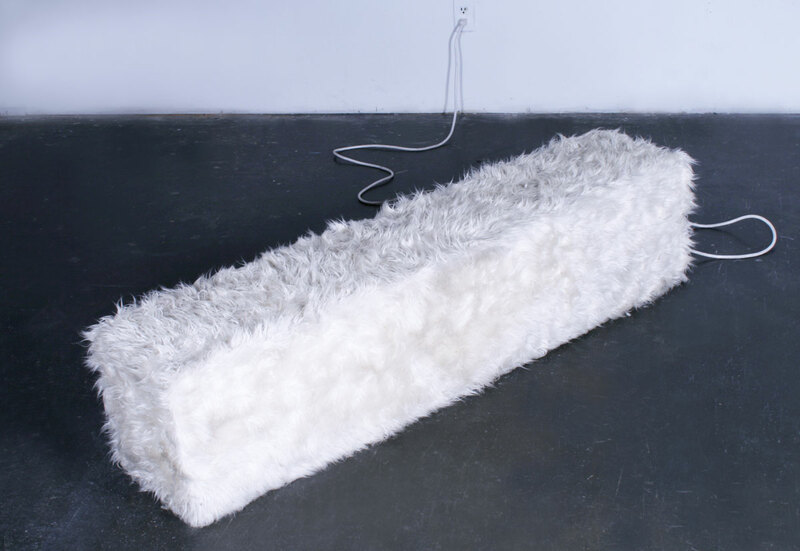 Polar Subwoofer is an interactive multimedia installation featuring an audio loop of an electronic bass composition written to the tempo of a polar bear’s heart rate during hibernation. Although polar bears are not "true hibernators," they do enter a similar physical state called "carnivore lethargy" where they slow their heart rate to an average of 27 beats per minute or (BPM). This piece employs the heart rate as the backbone, or metronome, for the composition. Born from this natural rhythm, the work evolves to produce an experience that fuses the natural with the technological. When sitting or lying on the subwoofer, the viewer is connected physically as the bass tones migrate through the piece into their body. The work is meant to affect the viewer and bring them into a more relaxed state, much like that of the hibernating polar bear. Polar Subwoofer is currently on view in the opening of the newly redesigned and expanded Art & Nature Center of the Peabody Essex Museum in Salem, MA. Beyond Human: Artist–Animal Collaborations features nearly 40 paintings, installations, photographs and audio and video recordings by artists who co-create or investigate art with live animals.